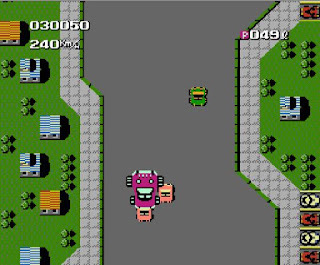 Bump 'n' Jump is a driving game that was first released in the Arcades in 1982. Your girlfriend has been kidnapped and it's up to you to hunt down the Jackals gang and rescue your partner. To do this, you'll need to survive 16 courses that are split into four districts (city, country yards, mountains and seaside). The d-pad is used to increase/decrease speed, B is the emergency break, and A allows you to jump; the latter is a key mechanic, as although you can bump opponents into the scenery, landing on top of them is more effective and results in them being instantly eliminated! The stages are the perfect length and offer short, bite-sized challenges that foster the 'just one more go' mentality. There's also a good sense of speed, and if you do happen to crash, the checkpoints are very fair. I also like how each stage offers a unique challenge by trying something new through its level design; for example, while Course 1 has wide lane roads to navigate, Course 3 features extremely narrow lanes surrounded by swimming pools. This forces you to use every trick at your disposal and it's fun making split-second decisions thanks to the responsive controls. Course 6 ups the ante by splitting the roads to the left and right once you become airborne; this results in the need to swerve quickly in order to land safely. The Course 16 finale includes a boss battle where you must continually smash him from above while avoiding being wrecked; it's a superb change of pace and makes you wonder why more bosses weren't included. 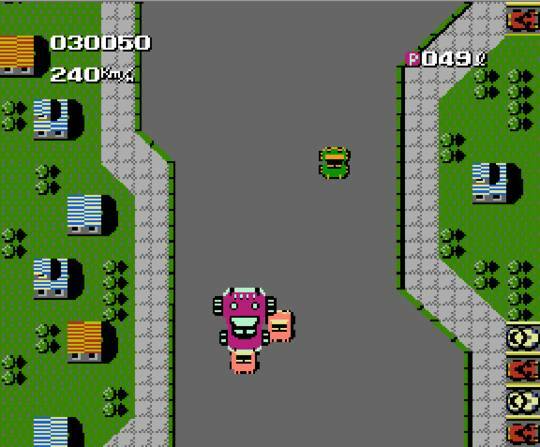 Despite this being a great NES port, it does look outdated when compared to other 1988 titles and the only minor upgrade from the original is the need to collect fuel icons. In all honesty, Bump 'n' Jump is a redundant port of a six-year-old game, but what it lacks in upgrades and content it makes up for in quality programming and addictive, twitch-based gameplay. As long as you keep your expectations in check this is an enjoyable title that's ideal for a quick 30 minute play session. Random trivia: Ports were also released on the Amstrad CPC, Atari 2600, ColecoVision, Commodore 64 and Intellivision.